Trying to prepare for work and I'm stunned by this article...can't seem to move. This article is excerpted from Barry Estabrook's Tomatoland, released this week,(early June), by Andrews McMeel Publishing. Disgusting how we treat our own species. Noted. It's all for the Almighty dollar. Noted. How could anyone treat other human beings like this? Too much of Fla.'s agriculture is based this way, its not just tomatoes. Strawberries, citrus, sugar cane..... And its not just illegals who have endured this . 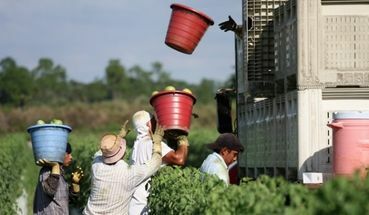 Plenty of legals, either citizens or migrants with a work visa, who followed the crops, have been subjected to the same thing. Thanks Nancy, sounds like a book I need to read. The truth is overwhelming and the amount of people involved. You have to wonder how people like Navarrete can face their own image in the mirror each morning. It's great that people like Barry Estabrook bring this abuse to light, but is the government of Florida doing anything about it? too many slave traders in this world !